Although women are typically known to collect accessories such as jewelry and handbags, guys have stuff, too! 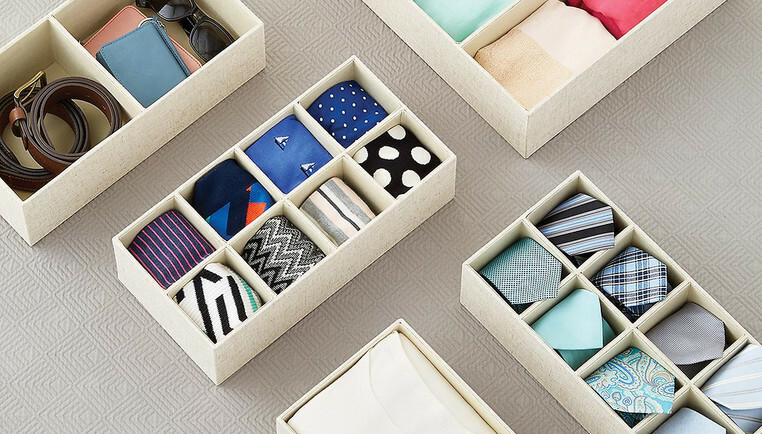 Here we'll show you how to best store and organize a variety of men's accessories. Whether you're into ballcaps or fedoras, hats have become a staple accessory for casual days and weekends out. It's important to keep your favorite hats easily accessible, the shape protected and free from dust. Fortunately, there are a variety of options to choose from. Wall-mounted hat racks or hooks make use of vertical space in your closet or even on the back of your door, while hat boxes are great for protecting special occasion hats. Ensure your investment in neckties and belts is properly protected by keeping them organized (and off the floor). Basically you have a couple of options. Decide whether you would rather see your ties and belts hanging full length. If so, look for tie and belt racks. These can be mounted to a closet wall or door, or hung over your closet rod. Or you can choose to go with bins or in-drawer organizers. Simple roll your tie or belt and drop in the appropriate compartment. Watches and glasses can be protected and organized in a variety of ways. One popular option is a countertop organizer made for holding watches or glasses. Look for ones with specialized compartments to keep items from sliding around. A soft, felted interior will help prevent scratches. Another option is to use jewelry or accessory drawers found in custom closet solutions like Elfa or TCS Closets. Collar stays, shoe horns, cuff links and extra buttons can easily make their way into every nook and cranny in a closet. But when you need them, they're impossible to find. Designate a small, clear storage box for each item and place on a closet shelf. Every day brings with it a pocket full of loose change, dry cleaning tags, receipts, keys, golf tees, mints and more. Don't let those little trinkets end up scattered across a counter top or dresser. Use a divided tray to serve as a valet and catch all when you empty your pockets each evening. Place it in a dresser's top drawer or on an easily accessible closet shelf.